The physical model of a tractor beam based on metasurface. Credit: A. Ivinskaya et al. Physicists from ITMO University have developed a model of an optical tractor beam to capture particles based on new artificial materials. Such a beam is capable of moving particles or cells towards the radiation source. The study showed that hyperbolic metasurfaces are promising for experiments on creating the tractor beam, as well as for its practical applications. The results are published in ACS Photonics. Tractor beams are familiar to many, thanks to the Star Wars, Star Trek and countless portrayals of UFO kidnappings. Yet scientists are trying to achieve such beams in reality, and there are already several ways to make objects move towards a source of light. So far, however, these objects are represented by small particles and atoms instead of whole cows. Researchers from ITMO University recently suggested using metamaterials to create such tractor beams. Metamaterials are artificial periodic structures with unusual optical properties consisting of repetitive elements. For instance, metamaterials can support hyperbolic modes: special states of the electromagnetic field arising when the metamaterial interacts with light. Such states help to control the optical forces that influence objects on the material surface, and, as it turns out, can help to move particles towards the light source. "Our work is fully devoted to creating the tractor beams based on meta-surfaces as well as to studying the physics behind it. We found out that this effect appears due to the propagation of hyperbolic modes in metamaterials. Such modes act as an additional scattering channel and, according to the law of conservation of momentum, can push the particle in the direction of the light source. At the same time, metamaterials have a number of other advantages compared with alternative methods of obtaining the tractor beam. Therefore, metasurfaces are more convenient for practical use," says Alexander Shalin, the head of the nano-optomechanics laboratory at ITMO University. In 2016, scientists from ITMO University proposed another model of the tractor beam based on plasmon resonance and propagating surface plasmon waves—oscillations of the electron gas near the metal surface. The flat substrate allowed researchers to work with the entire surface of the material instead of small areas, as in classical plasmon tweezers. 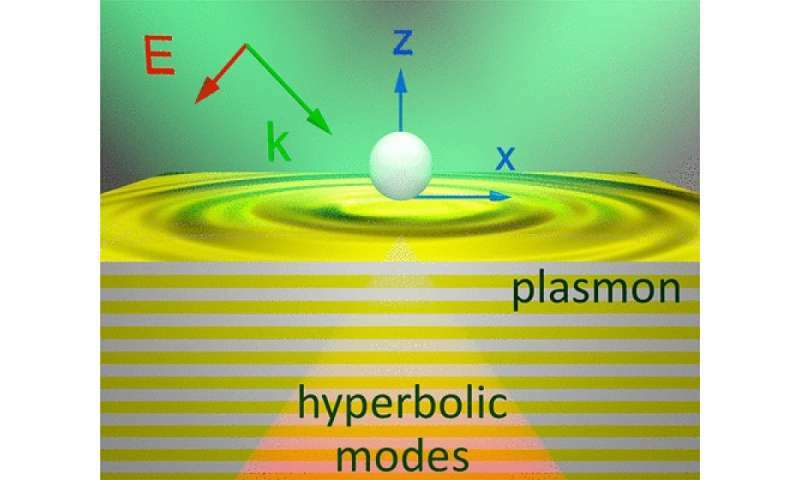 However, the new work showed that metamaterials based on flat structures that support both hyperbolic and plasmon modes can become an even better basis for the tractor beams. Metasurfaces and metamaterials work with light in the entire visible wavelength range and better cope with energy losses. All this makes them promising for the experimental implementation of the tractor beams. "In future works, we plan to conduct experiments for obtaining the tractor beams. This is a mandatory step toward the practical application of this phenomenon. In the near future, this technology will not help us to attract spaceships and kidnap cows, but it still can be used, for example, to create special traps for particles and cells or to conduct chemical reactions selectively," says Alexandra Ivinskaya, the first author of the article. Gravity acts like a tractor beam in vacuum, moving all objects, light and heavy, at the same rate of acceleration.